In 1851, at the United Kingdom’s Great Exhibition, patrons were introduced to a different kind of tea, unlike the popular green and black versions. This tea, as a matter of fact, wasn’t really tea at all — as teas are produced from one plant called Camellia sinensis. This tea, however, was steeped from coffee leaves. It didn’t catch on in the UK. Now let’s fast forward to 2004. Picture yourself shopping in a busy city market in India. People are drinking a dark, bitter tasting tea. You ask around and discover that it’s coffee leaf tea. Apparently, it did catch on and make its way to the exotic sub-continent. Now here’s where it gets interesting. Doctors from India’s National Institute of Pharmaceutical Education and Research wanted to investigate the reasons behind the continued low rate of diabetes in their country, despite the introduction of a more Western diet, including refined sugars. They already knew that some spices helped, like turmeric, but they also thought about coffee leaf teas. Few people in the West drank them, but many people in the East did. Could this be another reason? The first coffee beverage, according to Ethiopian tradition, was tea brewed from coffee’s leaves. Grinding and roasting coffee beans came much later, apparently. The original coffee leaf was called Kuti, named after the small village where it was first produced. 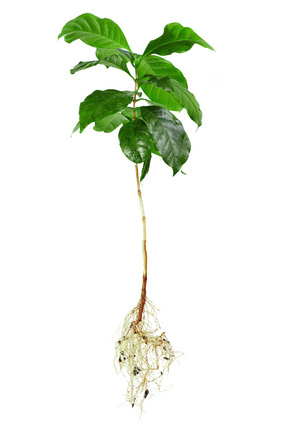 Kuti is naturally caffeine free, as it comes from the leaves. It’s bitter, but most people who try it seem to like it. In a study, researchers from India analyzed coffee leaf’s antioxidants. They discovered a lot of natural phenolic compounds known as xanthonoids. This caught their attention, as xanthonoids are known for their gastroprotective and anti-diabetic effects. One in particular, mangiferin, was in high concentration. The results showed a significant lowering of fasting glucose levels at different timed intervals. Additionally, mangiferin significantly lowered total cholesterol, LDL-cholesterol, triglycerides and increased HDL-cholesterol. So, Where is This Coffee Leaf Tea Anyway? Okay, fast forward to today. What happened to coffee leaf tea, and specifically mangiferin? Nothing. It simply never caught on … again. But because of the UK’s Royal Botanic Gardens and the French Research Institute for Development, this is about to change. Expanding on India’s research, the English and French are initiating a series of human clinical trials testing coffee leaf’s effects on diabetes. Currently they are testing 23 types of coffee leaves in order to identify the different xanthonoids’ composition. The next step will be to test coffee leaves clinically. If India’s research holds up in humans, the next well-deserved trend may very well end up being coffee leaf tea. Let's see where it goes! That would be terrific if it is something that does work for diabetes! It would certainly help a lot of people! Green coffee extract is considered to be a natural diet supplement, and a nourishing drink. It is often used for the purpose of healthy weight loss. Anonymous - You can pulverize the leaves, brew, and steep it. Some people add milk or cardamom to enhance the flavor.